The most popular destinations for Brits looking to get away from it all are Dubai, Bangkok and Spain. Rob Gill reports. Where do Brits most love to travel during winter? Dubai and Bangkok are the top two destinations for UK holidaymakers looking to escape the British winter weather followed by the Spanish destinations of Barcelona, Malaga and Alicante. 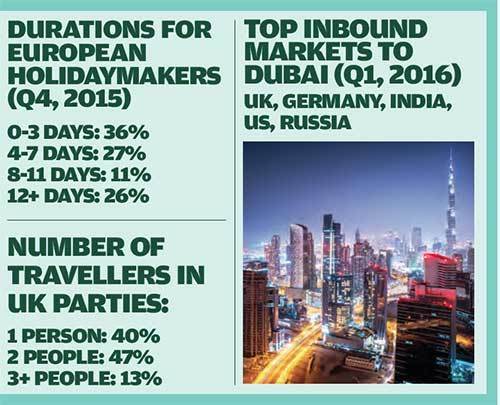 These were the findings of research firm Sojern in its latest Global Travel Insights report for the final quarter of 2015. “The UK saw a high amount of trips booked to Dubai and Bangkok (pictured above) between July and November 2015 for the travel period of December 1 through March 31,” the company noted. The popularity of Dubai in the European winter is emphasised by the fact that 8 out of the emirate’s top 10 source markets between January and March are in Europe, with the UK leading the way followed by Germany. Meanwhile, Barcelona also ranks as the favourite European gateway for winter sports holidays due to its proximity to ski resorts in Spain, Andorra and France. The Catalan city is closely followed by Munich, Geneva and Zurich as the most popular gateways for ski breaks in Europe. Sojern also found that the majority of winter sports travellers booked trips individually with those departing on a Saturday the most likely to be booking in groups of two or more passengers. The most popular departure day for ski travel is on Friday followed by Saturday, although those planning ski trips of more than three days were more likely to fly out on Sundays and Wednesdays. In compiling the report, Sojern analysed travel behaviour across the world including data from airlines, online travel agencies, metasearch engines and other travel providers. For long-haul travel throughout the year, the study found that the US and Thailand were the most favoured destinations for European holidaymakers for the whole of 2016. Among the destinations to drop down the list – albeit slightly – were India, Morocco, Indonesia and Vietnam. The biggest year-on-year mover has been Brazil, which went up from 17th to 5th place in rankings based on search and booking data up to December 31. This increase may be attributed to Rio de Janeiro’s hosting of the summer Olympic Games during August. Although Sojern said there had so far been a bigger “jump” in departures during the first three months of 2016 compared with the Olympic period. This data was however compiled before the outbreak of the Zika virus in Brazil, which has been declared a global emergency by the World Health Organisation. Sojern said it was too early to assess the impact of this crisis on booking patterns to the country and wider region. New York has taken over from Bangkok as the top long-haul city for European travellers compared with last year, with the Thai capital ranking second. There are also four other US cities in the top 10 for 2016: Miami (3rd), Los Angeles (4th), Orlando (8th) and San Francisco (10th). Also making the list are Istanbul, Dubai, Phuket and Tokyo. “Notable changes in this list include the rise of Dubai, which climbs from 11th to 6th position over the entire year, and Havana, which rises from 18th to 9th for first-quarter departures. Las Vegas drops off the list of top 10 cities for long-haul travel for Europeans in 2016,” says Sojern in its report. Sojern found that the majority of long-haul trips booked by European holidaymakers were for 12 days or longer with most opting for travelling as a couple or family group. For example, 47% of UK travellers went away as a couple compared with just a third of US holidaymakers. Unsurprisingly family bookings peaked at a share of around 30% in the summer school holiday months of July and August, while couples travelled more in the autumn shoulder season, particularly September and November. “As most travellers research and book their trips only several weeks in advance, January and the first quarter of the year, in general, are the top months of departure, with the exception of summer holidays with departures in July and August,” said the report. There is good news for the UK inbound market as it becomes the number one destination for US travellers for 2016 – taking top spot from India in 2015. The Sojern report also takes a detailed look at the impact of the Paris terrorist attacks on November 13, 2015 in terms of both intent to travel and bookings. It found that those intending to travel to Paris from within Europe dropped by 50% on the days immediately following the atrocities compared with the previous week. “Few things can hurt a tourist destination like a terrorist attack, and the impact of the events in Paris were clearly felt across the globe. French travellers were the first to rebound from the attack and showed increased travel intent from as early as November 21, just over a week after the attacks,” said the report.